I urge you to join us in praying for the Spirit of God to fall on the hundreds of pastors and church leaders attending this conference…pray for repentance, renewal, and re-empowerment for all of us! You can help us give training, ministry resources, Bibles, salvation tracts, and a nourishing meal, to the hundreds of church leaders attending our conference. Many, if not most, Filipino pastors and church workers do not have the means to get thorough ministry training and materials; however, because of our gracious ministry partners like you, we will be able to provide these things to the Filipino church leaders and better equip them for ministry service. We are taking a team to the Philippines from the “Celebrate Recovery (CR)” ministry from my home church, Houston’s First Baptist Church. CR is a support group ministry, helping those with life-hindering issues to work through and move forward from such issues with the help of Jesus Christ. 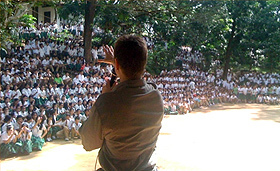 Our team members will be sharing their personal testimonies with thousands of students during our numerous school programs throughout the city of Manila. Our life testimonies will give hope to many youth who are battling with wounded hearts, drugs, alcohol, peer pressure, and other issues. Most importantly, we will be preaching the Gospel and calling all students, teachers, and school staff to the cross…pray for thousands of students and school workers to surrender their lives to Jesus Christ! To get help for your own life issues, visit the “Wounded Hearts” section of our website at: www.scottnute.org. Can you help us…will you help us? Your timely financial contribution today will play a significant part in the impact we will have in the lives of youth, families, pastors, and church leaders in the Philippines! I thank you now for your help and partnership…we truly appreciate how you care enough for others to give from what God has given to you to help the people of the Philippines! 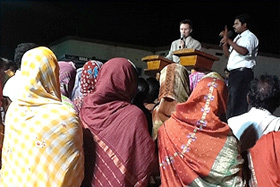 Reports are coming in from India telling how busy the pastors and churches are following up with the more than 250 people who made commitments to Jesus Christ at our recent region-wide “Festival Crusade.” Over 150 village churches scattered throughout a southeastern part of India were involved in this outreach. Many of these new Indian Christians will be baptized, which in their culture is a brave step of faith because a public display of following Jesus Christ like baptism increases the risk of persecution. Please join us in prayer for these new believers! Are you regularly sharing your faith in Jesus Christ? Don’t miss out on the wonderful joy and eternal blessings of your personal evangelism responsibility. Here is a verse that gives both the benefits of being involved in personal evangelism and the consequences of not, “He who gathers crops in summer is a prudent son, but He who sleeps during harvest is a disgraceful son” (Proverbs 10:5). Visit our website at www.scottnute.org where you can get free practical resources on how to share your faith with others, as well as daily Bible studies and ongoing discipleship materials. You can also get salvation tracts you can share with people you know and people you cross paths with that you don’t know…all for free! It is exciting and motivating for me to be a part of our growing ministry! Presently, there are several ways you can be a part of what we are doing by helping us in the following positions: Bookkeeper and Donor Relations. Another way you can help is spreading the word of our ministry to others you know. A great way to do this is “Home Dinner Meetings,” where you invite your friends to your home for dinner and share about our ministry. Also, contacting your friends and asking if they would be interested to receive our monthly mail and/or e-letter ministry updates would help us. 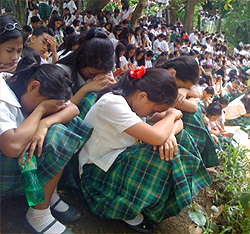 Plans have been in motion for several months for our upcoming project next month in the Philippines. Our Asia director and advance team are making final preparations in several schools where we will be presenting our program to thousands of students. Plus, we will be hosting the largest Leadership Training Conference we have held to this point, and the theme of the conference is “Revival & Spiritual Awakening in Asia.” We will be taking a team with us from my home church, Houston’s First Baptist Church. Please join us in prayer over the next few weeks, for a true Holy Spirit movement of God…for revival to fall upon the Philippines! 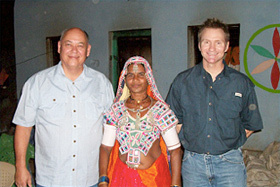 Next month, I will give details of this tremendous opportunity the Lord has opened up for us in Asia. We are grateful to you our ministry partners for all your support! To those who have been supporting this ministry for years, I say a heartfelt special thank you! At our dinner benefits a few months ago many people pledged support to our ministry, and to this point around 50% of you who made a commitment began fulfilling your pledge with actual financial support…thank you for keeping your word and helping us! (To those who have not yet begun fulfilling your pledge to our ministry, I hope you will today!) You are making a difference in many lives for now and eternity!